Dover Thrift Editions win the prize for lowest cover price, ranging from just $1.50 to $5. Naturally this means they are going to be low quality with virtually no commentary. Basically, they’re great for a one time read, but not something you want to keep on your shelf. Signet Classics (Penguin) can run upwards of $10, though this is rare, and they have decent introductions. These mass-market paperbacks are of a higher quality than Dover Thrift Editions and there are approximately 160 more titles to choose from in this collection. Barnes & Noble Leatherbound Classics offer the largest selection of classics in a beautiful, low-cost format. There are nearly 90 classics in this collection versus about 30 in the Penguin Clothbound set. These faux leather bound tomes range from $18 to $20 for adult books and $9 for children’s books. Many feature full color illustrations. Penguin Clothbound Classics are perfect for those who prefer a less garish, more shabby chic collection for display. They are smaller than Barnes & Noble Leatherbound Classics and run about the same or slightly higher in price. These editions also have introductions, which is a nice feature. Penguin Drop Caps are brightly colored and stunningly beautiful. This collection consists of one title for each letter of the alphabet (by author’s last name). Titles include traditional classics such as Jane Eyre and modern classics such as The Secret Life of Bees. Prices are about the same as the clothbound classics. Oxford World Classics are great for all readers, but especially useful for students. This collection features over 750 titles, many of which are not available from other publishers. For example, everyone and their dog has published Jane Austen’s six novels, but only Oxford publishes her juvenilia. These conveniently sized paperbacks generally run from $8 to $15 and include a number of handy study tools. Penguin Classics are perfect for laypeople and high school or non-English major students. They offer many of the same study tools as Oxford Classics and usually cost under $10. Great Illustrated Classics are a great tool to start young children off reading quality literature. They are abridged, simplified, and—of course—illustrated to make them more approachable. There are 66 $8 hardcovers in this collection. Sterling Classics are perfect for kids who are ready to tackle unabridged classics. 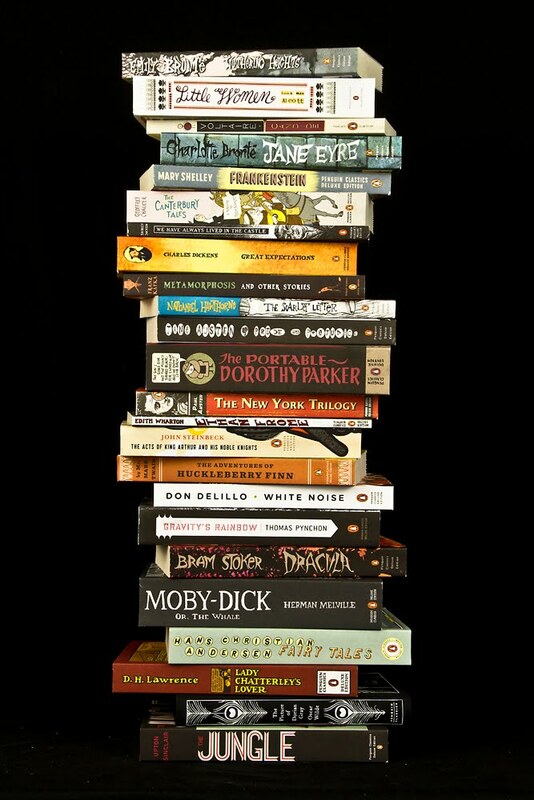 There are 36 hardcovers in this collection (three times the size of the Puffin Classics selection), each costing $10. Sterling also publishes a small collection of illustrated classics. Penguin Deluxe Editions (including Graphic Deluxe, Penguin Threads, and Penguin Ink) are great for the causal collector who wants stylish design and the convenience of the paperback format. Featuring French flaps and artwork by award-winning designers, this collection runs from $13 to $17 per volume. There are approximately 100 titles currently available. Modern Library Classics are a great choice for the paperback collector. They are reasonably priced and feature heavy paper, clear printing, and a sturdier construction than most other paperback classic editions. Modern Library offers a broader selection than offered by Penguin Deluxe Editions. The Folio Society offers the highest quality hardcovers for the serious collector who can’t afford first editions and antiques. They’re still pricey (to give you an idea, To Kill a Mockingbird costs about $50), but well worth it. The collection consists of over 400 illustrated books, all with slipcases. Everyman’s Library Collection is perfect for the hardcover collector on a tighter budget. Each volume generally costs between $25 and $30, and there are over 1,000 books currently in print, making it the largest collection listed here. The dust jackets feature a simple, elegant design that looks lovely on the shelf. Note: Edited to add that Folio Society editions come with slipcases.